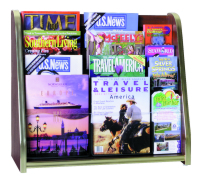 This counter top rack holds 20 brochures without magazines or 8 magazines and 4 brochures or another combination of both (with at least 4 brochures). Dimensions: 23 1/2" Wide x 20 7/8" High x 9 5/8" Deep. Copyright © Brochure Displays Inc. 2013 All Rights Reserved.